A wave of unusual bad weather has stricken Central and South China, with snow and temperature dropping much lower than usual. Well ... nothing special, I guess, for those who read from Northern America or Northern Europe, but the snow storms hit the fragile infrastructure of transportation of a country that is simply growing too fast to manage all the implications of such development, right now at the eve of the mass exodus associated with the holidays of the Lunar New Year. Train to/from Guangdong are therefore blocked because of the snow and the results is ...(read the news from AP and SCMP). Hundreds of police and soldiers were trying to control swelling crowds on Monday at a major train station in Guangzhou, where about 200,000 travellers were stranded by blizzards and ice storms that have created a transportation crisis during the nation’s busiest travel time of the year. The chaos might get worse as forecasters warned that new snowstorms and freezing rain could soon hit central and eastern China, putting more pressure on already strained transport, communications and power grids. The freakish weather has already affected 67 million people, and the total economic loss was 18.2 billion yuan (HK$19.7 billion), the Civil Affairs Ministry said. In Guangzhou station, a growing sea of stranded travellers – most migrant factory workers – filled up the huge plaza in front of the city’s main train station. They eventually spilled out into a busy thoroughfare that had to be closed to give people space to camp out while they waited for trains in the Guangdong capital. Radio announcements urged people not to go to the station because most trains have been cancelled and tickets were no longer being sold until February 7, the start of Chinese New Year – the nation’s biggest annual holiday. The weather started wreaking havoc two weeks ago when sleet and snow storms began snapping power lines for scores of electric passenger trains in neighbouring Hunan province – a midpoint for the busy rail line that runs from Guangzhou to Beijing. The ice storms also closed highways, and 24 deaths have been reported since the heavy snow began January 10, the Xinhua news agency reported. Officials in Guangzhou were scrambling to control the crowds and find temporary shelter for the migrant workers in schools and convention centres. Although it rarely snows here, Guangzhou was in the grips of a cold snap that was made worse by rain that has been soaking travellers. Officials estimated 200,000 people were at the station on Monday. Police blew whistles and barked orders into bull horns as they tried to control the crowd. Soldiers stood guard at key spots around the station. There was a threat protests or worse could be sparked by the workers, who already have a long list of grievances, such as rising living costs, poor working conditions and low salaries that often go unpaid. So far, the scene in Guangzhou was relatively calm. Many of the workers were stoic or cheerful, accustomed to huge crowds, discomforts and long delays. One young mother who would give only her surname, Yang, spent the night on the street in front of the train station with her 7-month-old daughter. The ground around her was littered with chicken bones, sunflower seed shells and cigarette butts. Ms Yang said her morning train was cancelled, and she thought her only option was to cancel her holiday visit with her family in neighbouring Jiangxi province. She said she would probably spend the holiday in her small apartment in nearby Foshan city, where she works in a factory that makes digital cameras. Tens of thousands of passengers stranded at Guangzhou railway station in cold, rainy weather are willing to wait until the last minute for trains home for the Lunar New Year. After working in a Dongguan arts and crafts company for almost nine years, a Hubei passenger surnamed Yan said he and his family of three had prepared food and water for three days in case of train delays. He said he had heard about service cancellations on the Beijing-Guangzhou railway caused by heavy snowfalls in Hunan and Hubei before coming to Guangzhou. But his family still wanted to give it a try because some of his friends had already managed to get on a train home. "That is why we want to wait here until we have finished all our food and water," he said, adding that his seven-year-old daughter was born and raised in Dongguan and it would be the first opportunity for her to see her grandparents in Wuhan . Gao Wenbing , a migrant worker with a Dongguan construction company, said he also preferred to wait at the railway station even though senior Guangdong officials had urged migrant workers not to go home this year. He did not want to move even to the Canton Fair exhibition buildings, opened for stranded passengers 500 metres from the station. "I will miss the boarding call if I move to the buildings," he said. Guangdong party secretary Wang Yang , who visited crowds at the railway station on Monday, said passengers should be ready to spend the Lunar New Year in Guangdong if trains were cancelled. By 6pm yesterday, more than 400,000 passengers had left Guangzhou on 199 trains which were forced to detour via other lines to avoid snow-bound tracks. But about 300,000 other passengers were stranded in Guangzhou and more were flooding into the city, Xinhua reported. Passengers inside and outside the station said the cold and rain had increased their misery. Mr Gao, who has worked in Dongguan for about five years, said it was the coldest winter he had experienced in the province. Li Chaobing , a Hunan migrant worker, told doctors in a shelter that he felt sick after being caught in the cold rain. Some other passengers who were moved into the buildings after Sunday complained that officials had failed to provide the free water and biscuits offered before. "I moved in on Monday afternoon and had to buy some instant noodles myself," said Shaanxi worker Wu Jiaqi, "I felt cold at night and a little hungry now." Guangdong Meteorological Bureau expert Lu Shan said temperatures would drop up to 3 degrees Celsius today, down to as low as 4 degrees at night. Here in the deep South, snow is not possible, but the temperature dropped to 3/5C. This morning has been one of the toughest run in my recent past: 5C, rain, dark, cold wind from the North. My clothing totally unsuited: silk gloves, light lycra tights, no cap . Usually the roads are bustling with people even very early in the morning, but today It was dramatically quiet and empty. I am taking 3/4 days off from running for a mental recovery before tackling the last part of the local running season (because of the heat, there are no more serious races from April onwards). All the race in March, April are not longer than 10k, so it is time to hone my speed and tweak the training plan. The target of this training cycle is to improve leg strength and leg turnover and increase the anaerobic capacity.. I am curious to see what will happen: having a good endurance base, I should improve further, but maybe the increase in exertion may backlash against my excellent aerobic form of the moment. It is an experiment worthy to do, since feel already very satisfied for this season and nothing to lose. My next "great" target is to tackle 2h35'/2h36' at a fall marathon: I prefer therefore to reach an higher level of "basic speed" now, to reach a 10k pace of 33'40" that should be a good base to work later on endurance, strength and longer AT intervals. Small note: this blog got an unwanted spike in the number of visitors last week-end, due very mis fortunate "cyber-debate" over someone's training plan. I feel very unease about talking again about this, but still I do not understand why my critical comments created so much discomfort in the blogger. If you post a running blog and leave the "comments option" open, you must also ready to take some criticism, if not done in vulgar or offensive tone. Otherwise "cheer leading comments" alone can get quite unconductive after a while. Said that, incident close and you are free to write that I train like a donkey and I better hang my shoes. from Latin ... can be translated as "Different times, Different manners"
Yesterday night was our company's "Chinese New Year Party". It is customary here that each company holds dinners or parties to celebrate the incoming lunar year and we are no exceptions. This week is a "tour de force" of 3 different parties/dinners for different branches in different locations and luckily I skipped another 2 dinners earlier in the month. Usually it all ends up in heavy drinking, lucky draws, pictures with the staff, too much eating, etc. Anyway, yesterday was the time of the party for our Dongguan factory workers: a 3 hours show for everybody and families, with dancers, games, singers, lucky draws, clowns, etc, etc, in front of an audience of around 1500 people. I did not follow directly choice of the "artistic program", so it is amazing to notice how much the habits have changed in China in the 10 years I am around here. it comes 2008 and the dancers are very very "skimpy" dressed !!!! 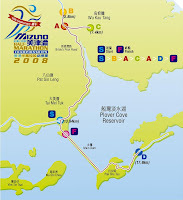 The organizers did not hide behind "soft wording" in describing the course of the China Coast Half Marathon/Marathon, a great AIMS certified race that has 25 years of history. I joined the Half Marathon, because I was very curious to see this famous course, since I have never been there even for a hike or a stroll. For those interested, a more detailed MAP is on run.com. 3 races in 20 days, so I was not sure what to expect in terms of performance. The starting list of the Half Marathon was quite good, with 5 out of the 10 top finishers of HK Half Marathon Championship of 2 weeks ago, therefore earning a good position at the end was far from granted. After 2-3km I felt that was going to be a good day: the legs were incredibly fresh and the HR was barely around 170bpm, more like a marathon effort. I felt the same sensation of power and freshness as 3 weeks ago in the 30k race. In the HM of 2 weeks ago, I started already half beaten up and tired, all the race was a struggle. Said so, I can say that I had my race under control: the first runner was for sure too superior to my level for targeting the 1st place, but I did not want to miss at least the 2nd place. After 5/7km quite easy, I increased the effort to reach at least 175bpm, so I did leave behind some runners. At the 10k mark, I was still very easy and HR still around 175, so it was time to increase again the effort, push on a long hill around the 13km and drop all the remaining runners to gain the 2nd position. From that on, I went full throttle with HR at 180 and open a good gap. The first was not very far but his 10k time is 1 minute less than myself, so I do not think that I had a chance for the victory anyway. He is a better runner, that's all. Close in 2nd Overall in 1h16'14", that is really an outstanding time due to the severity of the course. Average HR during the whole race was 175bpm. 2 weeks ago, in the last HM, I hit a 181bpm in average, so the difference in freshness and recovery shows up also in the HR data. Overall very good feeling during all race. the experience of 3 races in so short time is therefore completed and I feel incredibly good. Probably the pain in the calves and knee in the past weeks helped me to limit the effort in training and save the good energy for the race days. Now a period of rest, to prepare for the final of the season. But we will discuss this plan next time. I come back to the issue of Orthotics because it is an interesting subject, and for sure there is no definite answer, yes/no. Thanks to everyone who gave his input on the matter, I will for sure investigate the feasibility. This season I trained both with/without orthotics and also raced with/without. I strained my piriformis muscle after a race without orthotics, but it is a chicken/egg issue whether the strain was due to racing without orthotics or because I was using very light racing flats or, at the opposite, because training in orthotics reduced the range of motion of the muscle and therefore predisposed it to be strained. In my personal case, the heavy pronation is not due to "flat feet" but related to my "bow legs" and leg length difference. 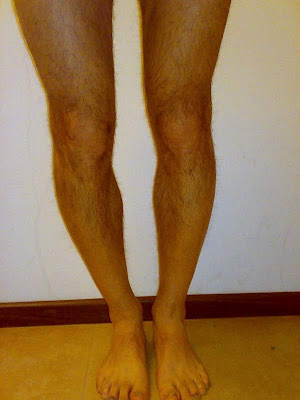 The leg length difference is an hefty 1.5-2.0cm (0.6-0.8 inches). - Exhibit B: my legs are so much curved.... Therefore the transmission of weight from the upper body to the ground is not vertical, but along a inclined axis, hence the rotation of the ankle/feet in heavy pronation to amortize the force itself. I hope that this material could give more data for your comments/suggestions. Unfortunately I can not find in Hong Kong a real expert in running biomechanics who could assess the situation first hand and give me advice. My idea is to start to cut down on the level of support (now I use Kayano + Orthotics), so maybe just orthotics with neutral shoes or just Kayano and also make more training runs in lighweight trainers, to let gradually strenghen the feet. Currently I am also using a 3mm insole on the right leg to partially compensate the leg difference. I am going to stick with it because I feel not to run more balance, with more power transfered to the ground by the right leg (before, basically I felt that mostly the left leg was doing the job...). 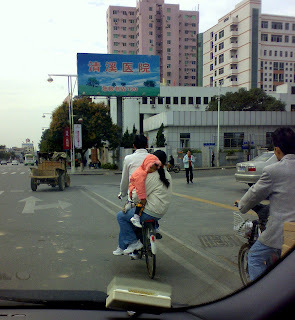 Dongguan city has banned motorcycles from his streets (for public security, safety and traffic management purposes....) and this ban has obviously also hit those in need of transportation who can not afford a car. So the "wealthy" gets the streets empy for driving cars more smoothly and the others have to survive somehow (that is the rule #1 of "China Life": big fish eat small fish). The pic was taken this morning. The kid was totally asleep. but otherwise it seems a vicious loop of feel pain, taking voltaren and train easier and easier. The form is still very good anyway: yesterday early morning I did a Tempo Run of 12k at 3'38"/km pace, very easy because the HR did went over 170bpm only for 16' out of 43'. It was much more of a "fast Marathon effort" than a real tempo. Now I would like to invite your comments about Orthotics and Support Shoes. I started to wear orthotics mid of last year to correct my pronation problem, plus a 3mm lift to partially compensate a large leg length discrepancy that I have from birth. I do not know if my improvement is also due to the orthotics (I do not use them in race), but after these months I start to hate them because I feel that my feet are completely losing their elasticity and flexibility. Basically I feel like running only "with my legs" and not using the propulsive power of the foot. I may take the drastic decision to put the orthotics on hold and also ditch all the supportive shoes like Asics Kayano, while running only in lightweight trainers for a while, until the feet start to "move again". A reader asked me more details about my Marathon training program. I try to give an exhaustive reply in this post. Obviously I am not a qualified Athletic coach and relatively a "beginner" for running, so this can be my personal suggestion. Here we go, this is how I planned to Boston and Fukuoka. - duration: 16/18 weeks. It seems to me a ideal duration, obviously if you start already from a decent base. Less, and you have to cut short on some phases; more would involve stay motivated for really a long period. for Fukuoka, I targeted to run 7 days/week reaching an average of 100 km/week. That's make around 1 hours daily, it did fit my life/work needs. That can fit a 30km long run, a 16/20 km mid-week "big workout", plus other 5 easy runs ranging from 8k to 15km. I tried to reach this average as soon as possible in the program and keep it for most of the plan. Since it is not a big mileage, it can be mantained easily. it was all about running steady trying to get used to 7 days/week running and reach the target mileage with progression of +10km every week. I also managed to reach the 32km long run at steady pace, with other long runs of 25/28/30km. But every week I included at least 1 workout of "CV intervals"/"fartlek", to build-up aerobic power. The workout was something like 7x3minutes @ 10k pace, with 2min recovery jog. Possible variations were also 6x1000m or similar. The target was to reach around 20/25 minutes of work at good speed, without feeling tired. I also added some strides at the end of every 2/3 workouts. I would have liked also to add some workout (may be 3 in total) for increasing the leg strengh: something such as hill intervals or performing the "CV Intervals" on hills. the purpose of the phase was to increase the lactate thresold and also increase the severity of the long runs. - a Tempo Run, starting from 7km and increasing progressively to 14km. For the speed to keep, I referred to the tables in "Daniels' Running Formula", where the target pace of the tempo run is function of the duration of the workout. In many cases I missed the target pace because of the heat of the season, but the workout got progressively easier with the progression of the training and the improvement of the weather. I also noticed a drop of the HR at similar "perceived effort": in my first similar workouts last winter, I was constantly in the 175-180bpm range. More recently, I managed to stay in the 170-175bpm range (going faster), this gave me the chance to extend the tempo run to 14km, a distance that before was even beyond my imagination. Longer tempo runs are really a great "key workout". - a Long Run, with fast final. Something like: 1h30' at easy pace, than 3k (increased to 6/7km) at HM speed, cool down. That phase was the most demanding. I was pretty much "tired" and felt very relieved to touch the bed every evening. My rule was anyway to limit the "fast training" to maximum 25% of the weekly total (hence, around 20/25km), with the rest of easy pace. For easy pace, I was running around 75% of HRmax for normal aerobic runs and around 70% of HMmax for recovery runs. The purpose is to really simulate the effort of Marathon and progressively feel better and better to run at the target pace. So I scaled down to 2 "Big Workouts" weekly, to perform better in the "Long Run", that become the critical weekly workout. - Long Run: increase the distance progressively to 35/36km. The long run was at mixed pace: Easy pace and Marathin Pace. I started with something like 2x5km @ MP (recovery 1km easy), reaching 3x7km @MP 4 weeks out of the marathon date. 3 weeks out, I did also a 30km "simulation run" as follows: in complete race gear (shoes, etc), I did 13km easy + 15km @MP + cool down. For "easy" pace, I was around 75/77% of HRmax. - Tempo Run / Long Interval / Marathon pace: another workout was either to stimulate the AT or to simulate MP. So either some Tempo Run of 10/12 km or long intervals (such as 3x4km) or intervals at MP. I sensed that I was already in shape suited to reach my target, so I did not feel like risking an overburn for perhaps gaining 2 sec/km of extra pace. If you count the KM of "fast running", it always comes up to maximum 25/30% of the total. 70/75% was reserved to Easy pace. my tapering was only 2 weeks because it does not make sense to taper too much if the mileage is not that high. If you run 100k at peak and start to scale down the long run from 32km to 25km and the tempo run back to 8k from 14km, you already have a "natural" cut to 80km, that is enough tapering (20%..). I cut down the long run first to 28k (2 hours) and last one to 1h30'. The AT run was only perhaps 2/3 x 3km or something similar. 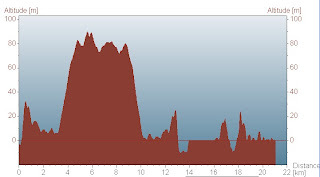 a) as mentioned before: some hill training in the first 2 phases. b) more strides: I felt my running stride did lose some sharpness with all those "slower" miles. Next time I will promise myself to add 5/6 strides at least 4 times weekly. 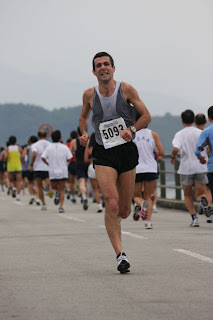 c) a good Half Marathon 4/5 weeks out: I may have build-up more confidence to run slightly more aggressively in Fukuoka if I had done a good long race in the training phase. I did not have the opportunity and my longest race was a 10k 3 week out. for those with plenty of time and passion for photo album, I selected some of the best photo reportage posted on the web, graciously of Thomas, David and Anthony. The running community in Hong Kong is really kind and supportive on each other, you will always find many shared photo albums on the web, rather than being ripped off by marathonphotos.com or similar. The race is the real yearly "showdown" for distance running in Hong Kong: period of the year, no conflicts with other races local or overseas, very large local media coverage. So all the competitive runners in Hong Kong show up for the race, and the race entries are full within hours. I had several doubts if I was fit for racing: the knee was still aching even at slow pace and the calves were still pretty tight and sore. But I really had the desire to make it, since for many years I missed it because of some holiday trip or injury. The fact that I was also entered in the team race with my club and therefore a last minute pull-out would have left the team out, sealed the decision ... and I set my alarm clock for a 5.30am wake-up. Temperature: 15C/60F, 2000 runners at the start. The course is a very tough loop with a mainly rolling uphill first section, followed by a return loop to the start point and a final flat 6k on along a dam. The start is right at the feet of a 400m long/15% gradient hill that immediately split the starting group into smaller packs. I was pretty excited to wear for the first time the new club uniform and make part of our "Team A", with team mates that were close to my level, so the internal competition would have been an added spice to the race against all the other best runners in Hong Kong. The demanding starting section immediately put the things into order in terms of race: a leading pack with the 4 best runners in HK (KO Chan, Gi KM, A. Naylor, Stevenson) took off and set for a race targeting probably the 1h12 mark. Two other packs behind gathered all the 2nd-tier runners. My plan was to avoid at all cost lactic acid build-up in the tough first section, to avoid losing leg freshness in the faster 2nd part. So I tucked in the 3rd pack, and mantained a effort such to avoid going over 180bpm in the uphill. We passed the 5k in 19'10", I was probably around the 10/20th place together with other 10 runners. In the downhill section, TM Choi (who was 3rd last week-end) made an impressive progression and shattered all our pack: at every 100m we were losing pieces, the pace was really crazy, I clocked a sub-3minutes Km and by Km 10 I was left alone to follow him, but I also could not follow for too long and settle in a more confortable pace, trying to still stay under 180bpm, in order to have some margin left for the final flat section. The positive thing is that I was now 10th alone and the runners ahead of me were appearing closer every mile. On the dam I was really struggling, my calves were tightening and I did not feel to have the energy to really place a "surge" in the final 5k. Probably others were even worse than myself as 2 good runners dropped out of the race in exhaustion and I caught other 2 with only 5km to go. From that moment on, I administered myself to the finish line, I was really scraping the bottom of the tank and I was damning myself for the silly idea of running back-to-back such demanding races. The picture is self-explanatory, but luckily I was only 500m from the finish. At the end, the result was far better than I could ever expect: 6th overall, 1h15'20" (new PB by 3 minutes) and overall I believe It would have been very difficult to make a better placement because all the runners ahead of me (except one) are by far much better level. It was also great to catch up so many talented runners in the final 5k. The timing is a great time on that course, I made up some calculations, to simulate a "smoothing" of the uphill/downhill effect and it is probably equivalent to 1h14 or 1h30'45" on an ideal situation. for the record, the race was won by Chan KaHo for the third time in a row in 1h12', while Wong SiuPing brought his endurance of best local marathon runner to a good victory in the female ranks. Out team did score an excellent 2nd, with all of us coming to the finish line very close to each other. Winter is arrived also here ... in the morning, the temperature drops to 8C/46F. Luckily day-time it warms up until 15C/60F. Do not laugh ... but after you get used to heat all year long, I felt pretty chilly. Keep in mind that I do not even have suitable gear for temperature in the single digits Celsius: yesterday I rushed to buy some long pants and mid/leg shorts at the Shenzhen Decathlon store (a French chain store that made really a good job in China), that has the best supply of basic running apparel. With the large disbursement of 40USD (we are in China....) , I bought a pair of long running pants, 2 pairs of under-knee pants, a pair of shorts, 2 long-sleeved jerseys and 2 pair of silk running gloves. The main issue is that homes here have no heating systems and the windows are totally unsuited for cold weather, so basically inside and outside the house you have the same temperature, unless replying on scores of electric heaters. To warm up the readers from cold climates, I added at the side the current temperature both in Hong Kong and Dongguan. For those who like snow, some interesting blogs from "North Pole"
some time ago I posted about a very original way to distribute fresh milk. 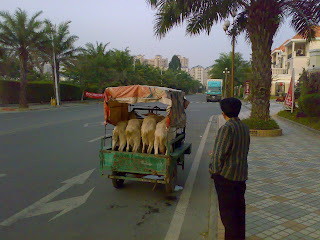 This morning, I run with the mobile phone and caught the "milkmen" in action. On the running side, my legs are still trashed by last Sunday hills: painful knee and tight calves until today. I am just taking it easy. - in general, lack of "speed" to run more comfortably in the 3'10"/3'15" . Once I run faster than 3'20"/km, I start to "hit a wall", even if aerobically I feel still some reserve. - build up my confidence that now I can run quite fast. Coming from being a "mid=pack" runner, I sometimes lack the confidence to try my chances in the races more daringly. -still to be defined, for sure another marathon in the fall (Fukuoka again ?). For the spring, I must face the issue that every single decent marathon in Asia or elsewhere would involved a long air trip, quite complicated with a small child. For the moment, I think about local races in the range 10k to HM. If someone has a good suggestion for a Marathon in April/May not too far from Hong Kong, you are welcome.